I believe a healthy back is crucial to living a healthy life. 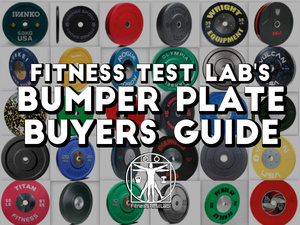 I’ve considered equipment like glute-ham developers (GHD) and reverse hypers for back strength accessory work, but I don’t have enough room for either of them. 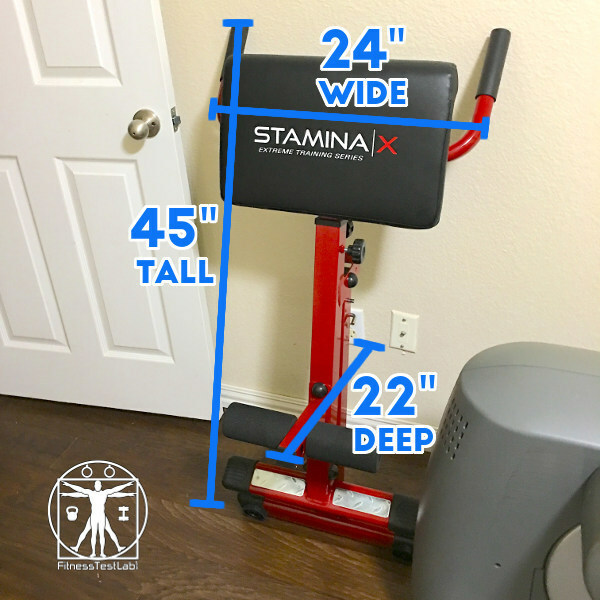 I came across the Stamina X Hyper Bench while looking for a space-saving alternative and I’ve now had a few months to test it. 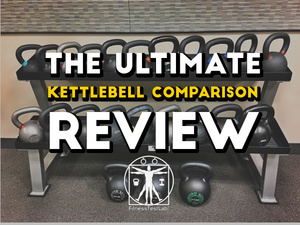 Although it’s not as compact as I initially hoped, it still works well enough for me to recommend as an addition to a small home gym. 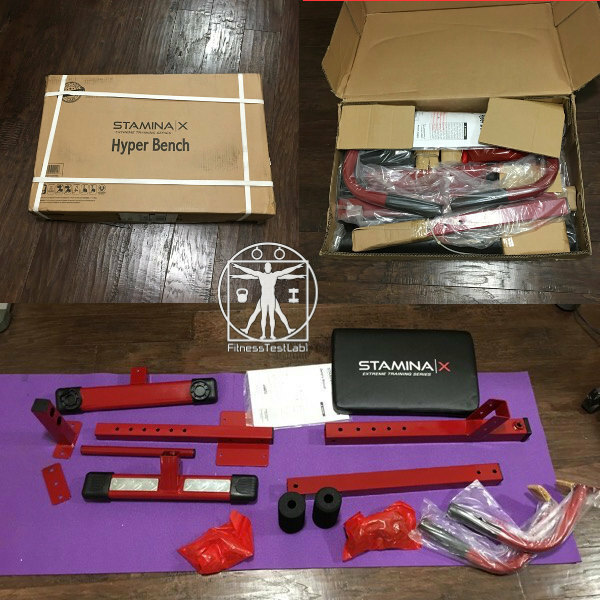 The Stamina X Hyper Bench arrives unassembled, so be prepared to spend a little time putting it together. 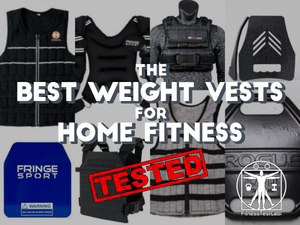 It’s not a difficult assembly though, and the tools required are included with the packaging. It took me about 35 minutes from unboxing to complete assembly. 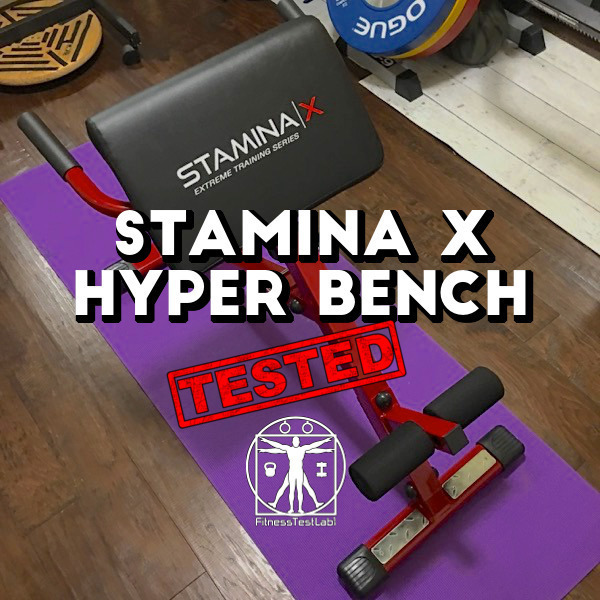 Overall, the Stamina X Hyper Bench appears to be well made. All the parts fit together perfectly the bench feels solid. I had absolutely no issues putting the bench together using the instructions and tools provided. The spotter arms take up extra space when the bench is folded, and I thought about not installing them. However, the bench is designed to be used with the spotter arms, so it wouldn’t be fair of me to test the bench without using them. I installed the spotter arms, but I’m not a fan of how much volume they add to the overall storage footprint of the bench. If I had my way, I’d rather see Stamina add more support to the bench pad and remove the arms altogether. 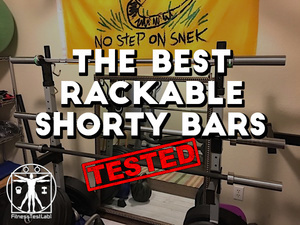 The Stamina X Hyper Bench is marketed as a core strengthening product and I’m sure it could be used for crunches and side bends in addition to back work, but I’ve only ever use it for working my back, glutes, and hamstrings. For my use case, it works very well. 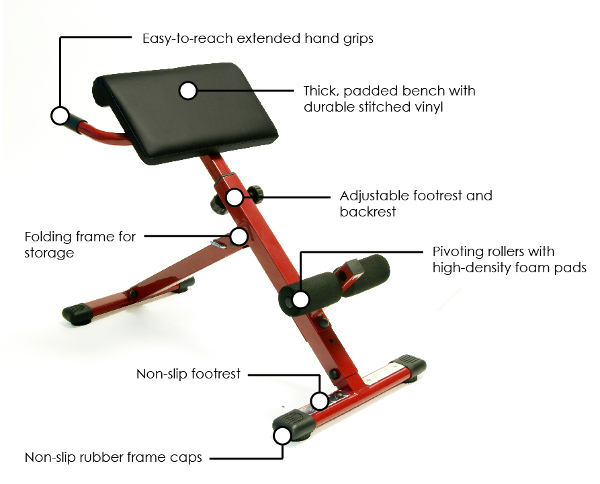 The bench is adjustable in height, and the foot rest can be installed in two positions. 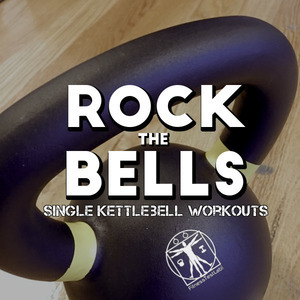 I’m 5’8″, and I was easily able to find a height and footrest combination that allowed me to do back extensions comfortably. 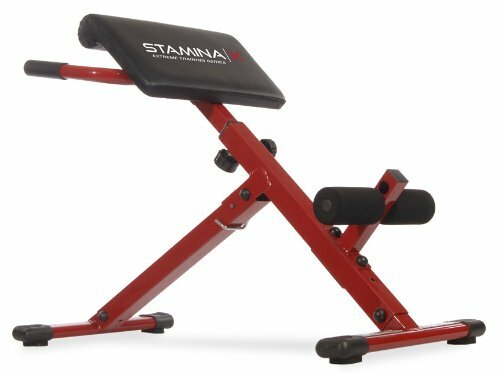 I was initially interested in the Stamina X Hyper Bench because it folded for easy storage. I naively thought it was small enough to fit under a bed, and would be completely out of the way most of the time. However, it’s actually quite bulky, even when folded, and takes up a large-ish amount of space. It definitely does not fit under a bed. I had a hard time finding measurements for the bench when folded, so for reference the folded measurements are 45 x 24 x 22 inches. 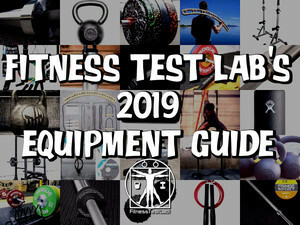 I want to stress that the size isn’t necessarily a bad thing, it’s only something to be aware of when considering whether or not you’ll have space to store the bench when not using it. They say good things come in small packages, but good things also come in medium-large packages. 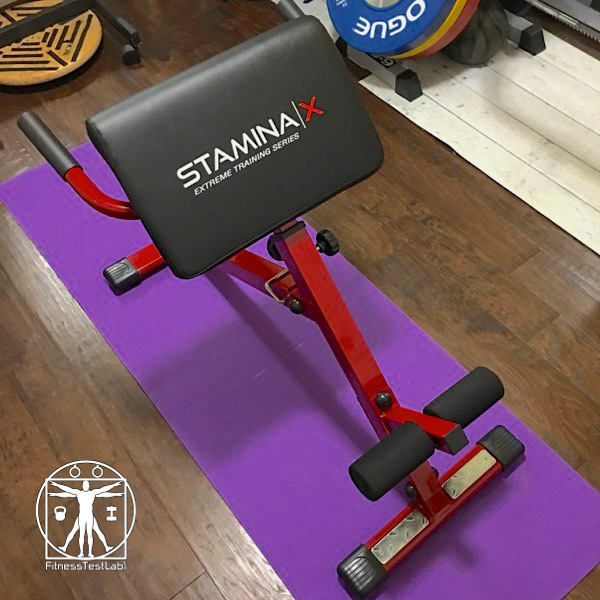 If you’ve got the space to store it, the Stamina X Hyper Bench is definitely a good option for back and core accessory work, especially for the price.